According to Russel’s circumplex model of affect, emotions can be classified according to their amplitude (low-high) and their valence (unpleasant- pleasant). Arousal can be measured by Galvanic Skin Response (GSR) sensors which basically measure the amount of sweat produced by one’s sweat glants. Although we are aware of how we feel (happy, sad, angry, surprised etc. ), sensors can measure small changes in our emotional states that might not be immediately so apparent to us. Based on this theoretical background we developed VibeRate, a wireless and wearable prototype which monitors the user’s arousal levels and when an increase in arousal is detected, it vibrates in order to make the users more aware of the increase of their arousal levels. VibeRate is small, wearable and wireless. 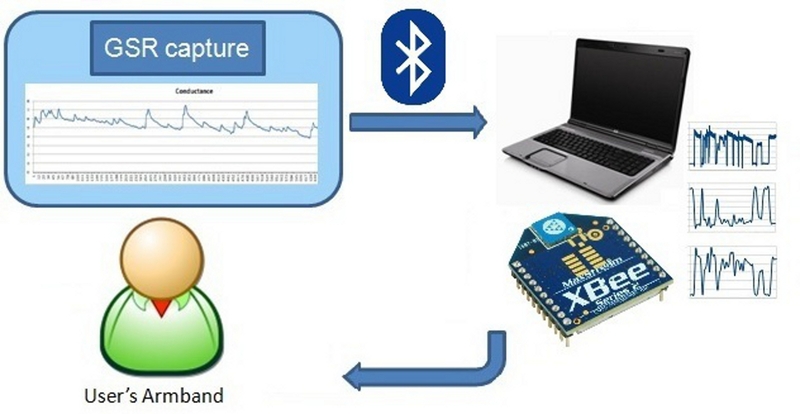 Our prototype weighs less than 300 gramms and it consists of a) a wireless GSR sensor developed by Shimmer Research that sends raw GSR data via Bluetooth to b) a laptop which communicates via xbee protocol to c) an armband (our first prototype) or a wristband (our second and third prototype). Two vibration motors sewed in the inner side of the armband and the wristband controlled by an Arduino FIO provide the vibrotactile feedback. The algorithm we developed was written in Processing IDE and it translates the raw GSR data sent by the Shimmer Research Group GSR sensor through Bluetooth to Skin Resistance and Skin Conductance values (measured in microSiemens). The GSR sensor is set to transmit data in 10 Hz (10 readings per second). A low pass filter is averaging these 10 readings and translates them to 1 reading per second. The algorithm we developed measures the difference between two consecutive seconds and when the difference is between 0.2- 1.0microSiemen it is perceived as an increase in the arousal levels of the user. When the user gets excited, a screenshot of the user’s online activity is taken and stored in the laptop and the armband vibrates for 500mS in order to make the users aware that the stimulus they are currently exposed to is exciting. The GSR values are also stored in a .csv file. The fact that VibeRate is wireless and lightweight gives movement freedom to the user, who is not required to be seated all the time in front of a computer screen. Of course some limitations exist since the range of Bluetooth protocol is usually between 10-15 meters. Finally with some modifications VibeRate and due to the fact that it consists of three parts (the GSR sensor, the laptop and the armband/wristband) can be used in different context where (self) awareness of one’s arousal is required by one or more users. * Viberate was the result of my Research while I was working as a Research Associate at School of Computing and Communications at Lancaster University from February 2011- August 2012. The research was part of DESIRE, an initial training network funded by the European Comission, framework 7 under Marie Curie Programme. It was presented at Affective Computing and Intelligent Interaction Conference (ACII 2013) that was held in Geneva, Switzerland in September 2013.